Ranked-choice voting’s potential impact on Maine legislative primaries? One race. The only race where it might be used on June 12 is in House District 75, and one of the three Republican candidates says he might sue if he loses. AUGUSTA — If ranked-choice voting is applied to Maine’s June 12 primary election, the system would come into play in only one legislative race – a House District 75 contest that features three Republicans. All three candidates for the seat representing Turner, Leeds and part of Livermore said Tuesday that they oppose ranked-choice voting on constitutional grounds, but only one said he would contemplate litigation were he to lose. John Pape of Turner said he would challenge the election results if he won a plurality of votes but lost the party’s nomination as a result of ranked-choice balloting, the hallmark of the citizen-backed law that is currently under review by Kennebec County Superior Court Justice Michaela Murphy. Murphy heard arguments Friday from attorneys representing the Committee for Ranked Choice Voting, which backed the ballot measure establishing ranked-choice voting and wants Secretary of State Matthew Dunlap to implement the system for the primaries. Murphy said Friday that she would quickly decide legal questions raised by Dunlap about the law, noting that voters are entitled to clarity about how the primaries will be handled. 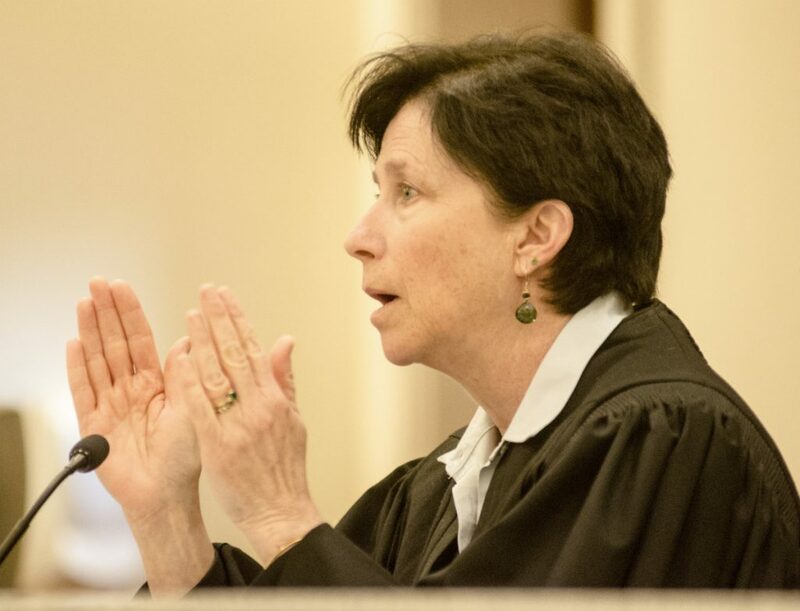 As part of the case, Murphy must also decide whether to grant intervenor status to Maine Senate President Michael Thibodeau, a Republican who sought permission to outline new issues with the ranked-choice law that he said were just coming to light. The Senate took the unusual step Monday of authorizing Thibodeau to make the intervenor request. In a traditional election, whoever gets the most votes wins, whether a majority or plurality – which can be less than 50 percent. Under the ranked-choice system, voters select candidates in order of preference. If no candidate receives more than 50 percent of the vote, the candidate with the fewest first-choice votes is eliminated. Voters who preferred the eliminated candidate then would have their ballots added to the totals of their second-ranked candidates, and the ballots would be retabulated. The process continues until one candidate has a majority. Pending Murphy’s decision, the ranked-choice system would apply in the primary elections for governor and the Legislature, as well as races for U.S. Senate and House. There are seven Democrats and five Republicans in the gubernatorial election and five Democrats in the House District 2 race. Support for the ranked-choice method divides clearly along partisan lines, with most Democrats in favor and most Republicans opposed. Pape and his two opponents in the Republican House District 75 contest, Joshua Morris and Angelo Terreri, are seeking to replace outgoing state Rep. Jeff Timberlake, R-Turner. He is running for election in state Senate District 22. He said that unless the tally is close, he is unlikely to challenge the results because of the cost to taxpayers. “I feel it would be very expensive for taxpayers, if I challenged it, and the one thing we don’t need right now is to have more of our taxes used in that type of manner,” Terreri said. Morris said that in a ranked-choice election with only three candidates, the person who wins the plurality is likely to prevail. He also said the system has altered his overall campaign strategy a bit. Pape said litigation could be in the works for his campaign if it was clear he had won a plurality and then lost to another candidate after the second-place votes were added in. “Don’t I have a constitutional right in Maine to be elected by a plurality?” Pape said. The three candidates also noted that all three towns in House District 75 rejected ranked-choice voting at the ballot box in 2016, although the measure gained support from 52 percent of voters statewide. Monday’s 21-13 vote in the Senate, which largely fell along party lines, to authorize Thibodeau to seek intervenor status also allows him to pursue a separate legal action in the case were Murphy to rule before he could ask her to consider the Senate’s concerns. Late Tuesday, Murphy had yet to rule, and it was unclear what legal action, if any, Thibodeau might take. Under the Senate order, as amended by Democrats, Thibodeau would have to keep his legal actions focused on the ranked-choice voting issue and would have only 21 days to take action before the order expires. Rob Caverly, Thibodeau’s chief of staff, said the Senate president was working on retaining legal counsel.